Summary: This tutorial will share you an simple method to deal with your Blu-ray and Windows 10 playback issue. Simply rip your Blu-ray to H.265 videos for playing on Window 10 without limitations. As Microsoft has removed the support for DVD and Blu-ray playback in Windows 10, in order to play Blu-ray discs on Windows 10, you'd better rip your Blu-ray discs to Window 10 playable videos. From Microsoft official website, we have known that Windows 10 gets native support for MKV and H.265 (HEVC) videos. So rip your Blu-ray to H.265 Videos on Windows 10 is a wise choice. To rip Blu-ray to H.265 videos on Windows 10, a professional Blu-ray ripper is needed. Brorsoft Blu-ray Ripper is highly recommended here. With it, you can rip (copy-protected) Blu-ray to Windows 10 compatible H.265 codec videos in ultra fast speed. Besides, It provides the preset format for various devices like iPhone, iPad, Android Phones, Apple TV, Game consoles, etc. Now download the free trail program and start to rip Blu-ray to H.265 videos for playing on Window 10. Run the Blu-ray ripper and click “File” ＞ “Load from disc” to import Blu-ray movies you want into the program. 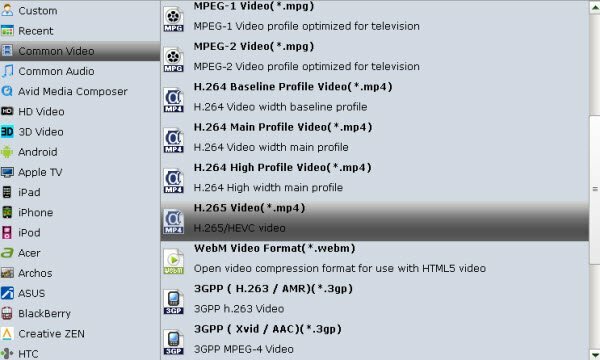 Go to the "Format" bar, select "Common Video"> "H.265 Video(*.mp4)" as your Output, which supports a higher definition quality but in a small video size. After all settings done, click "Convert" button and the program will rip Blu-ray movies to H.265 mp4 video immediately. Once the conversion is completed, you can play your converted Blu-ray movies on Window 10 just fine. And you can also use Video ultimate to rip and convert Blu-ray/DVD or videos to H.265 format for playing on Window 10 at ease. How to Play ISO files on Toshiba Smart TV via VLC?